Adokiye Amasiemeka Stadium in Port Harcourt, Rivers State, is currently a beehive of activities ahead of Saturday’s presidential primary of the Peoples Democratic Party (PDP). Twelve aspirants are seeking the party’s presidential ticket for the 2019 general election. The 12 candidates seeking to unseat President Muhammadu Buhari are: Atiku Abubakar, Sule Lamido, David Mark, Bukola Saraki, Ahmed Makarfi, Aminu Tambuwal, Datti Baba-Ahmed and Ibrahim Dankwambo. Others are Attahiru Bafarawa, Jonah Jang, Kabiru Turaki and Rabiu Kwankwaso. 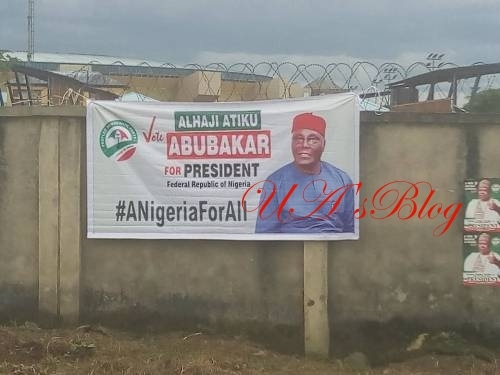 At the entrance of the gate, there were about six big banners of Atiku Abubakar. Posters of Aminu Tambuwal also flooded the venue and were located a few meters away from the stadium. Part of the fence which formed a perimeter around the venue was also covered with posters of Tambuwal. However, a survey by SaharaReporters revealed that there was no poster of Senate President Bukola Saraki. Also, the space at the front of the gate has more than 50 white canopies. Two of the canopies bear a big banner of Attahiru Bafarawa and were populated by Hausa-speaking people. There were some Fulani indigenes there as well. A few people, who wore white, also clustered around a canopy beside a well-painted street-light pole strategizing on Bafarawa’s chances of winning the ticket. Other canopies were taken over by people selling drinks, foods and all sorts of PDP-themed items, including the party’s flags, caps and wristbands. There venue is manned by the heavily-armed security operatives.